Deciding who sits with whom can be a challenge, but felicitous seating is an important element of hospitality, giving families and friends a chance to mingle, and old friends who haven’t seen each other for a while a welcome opportunity to catch up. Reception cards are both decorative and functional, beginning with table cards, which assign each guest to a table; then continuing with place cards and table number/name that helps people find their seats; and ending with menu cards that describe the meal. 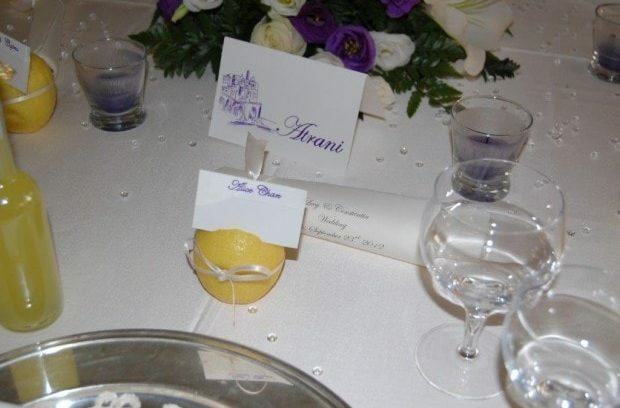 Seating details can carry through a color scheme or a theme…we often suggest local theme like a lemon with name card on top or view of towns of the Amalfi coast as table cards. If you dislike traditional types of seating cards we suggest something unusual: edible place card! You can ask your chef to produce tiny savor biscuits containing strips of paper showing the guest name on one side and table number hidden on the other. At the end of the cocktail hour these biscuits will be passed on alphabetized trays. Everyone will love the surprise!